At the end of April it was easy to be fooled into thinking that Summer was just around the corner. This week has reminded me just how variable the British weather can be. Whilst it has not been completely full of grey skies and gloom, I was a bit put out to see the hail come pouring down on several occasions – still ’twas a Bank Holiday Monday. But, before I get too melancholic (also note, I will be complaining if it is too hot in the Summer, should we get one), I still found plenty of new things this week (new for the year, I am not claiming to have made any exciting discoveries). On the insect front, the weather has made it pretty dismal, orange tip butterflies still taunt me when I have no camera handy, but otherwise I have not seen many insects about. There are still some bees foraging, workers as well as queens, and a few wasps to be seen. As far as flowers go, it appears everything is awash with dandelions and daisies, and, it seems the first dandelions have set seed already. 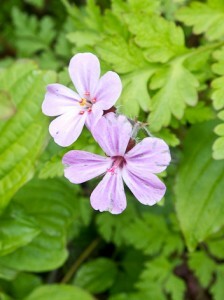 One flower that is also adding some colour is Herb Robert (Geranium Robertianum), a cransebill that grows in hedgerows. This plant was used in medieval times for its medicinal properties, being used as a remedy for nosebleeds and toothache as well as dysentry. The leaves, if rubbed on the skin, apparently repel mosquitoes, which I am not surprised by. This plant often turns up in the garden, and, if you pull it up and are not wearing gloves, its not very pleasant smell stays with you for some time. Whilst it is supposed to attract many insects, I must confess that I do not like to leave it in my garden as it does self seed quite prolifically. Speaking of gardens, my beans are growing quite well now after the threat of moving them indoors. The lemon balm is providing plenty of leaves for herbal teas and the bluebells are flowering well, showing up particularly in the less than ideal light we have had over the last week. However, it is the bird news that I find most exciting this week. On Sunday, a visit to the Country Park showed that the terns were back. Although there were plenty of swifts, swallows and house martins there did not seem to be any sign of the hobbies that often hunt them at this time of year. However, a check of Northants Bird Sightings seemed to suggest that the hobbies were back and some of those terns may have been arctic terns, unless they were being frightened off by the peregrine! I sometimes think my timing may be a little off! In the garden we have had two young blackbirds around, and I can say with certainty that there are young in the starling’s nest in the gutter outside my window! I also heard and then saw my first blackcap of the year on the old railway track. I am trying to improve my recognition of birdsong, the blackcap sounds a little like a robin, but more ‘burbling’. All in all, considering the weather, it does not appear to have been too bad a week. 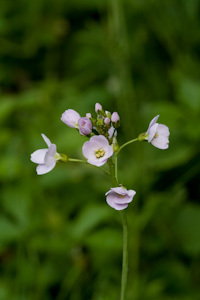 Posted on May 9, 2010 Categories NatureTags blackcap, Common Tern, herb robert, HobbyLeave a comment on The first week of May. Are you missing out on something this weekend? In the UK a bank holiday weekend is approaching and who knows, maybe the weather will be warm and sunny. So, a nation will get into its cars and head to the coast or the national parks, spend a few hours in traffic jams, looking for somwhere to park, looking for somewhere to eat etc etc. But, what are you missing closer to home? This weekend is the perfect opportunity to go out and look closely at what nature has to show you (for free and without needing to sit in a metal box on a long, boring stretch of concrete). I have a few suggestions to make, these are for those in the Daventry area, but I am sure there are similar things to be found wherever you live in the UK. Firstly, at this time of the year the bluebells are a must. In Badby and Everdon there are cream teas available this weekend for those going to see one of nature’s most beautiful spectacles. 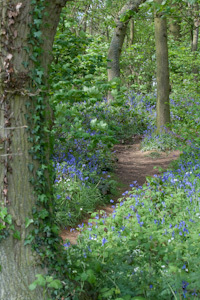 I went to visit the bluebells in Badby Woods for the first time last year. Apart from the spectacle of a sea of blue in all directions, the scent is astonishing as is the constant drone of the bees. I went to Everdon Stubbs this week which is stunning at the moment, but I was later told is also somewhere to hear a cuckoo, something I think of as the quintessential rural England. If you don’t want to go that far, how about a walk around the country park. At the moment the hobbies have returned and are swooping about at the far end of the dam, just in front of the trees, chasing larger insects and smaller birds. The swallows, house martins and swifts are also there, screaming about the water (being chased by hobbies!) as are the common terns, preparing to nest on the tern rafts and patrolling along the shallower waters looking for their lunch. The hedgerows are starting to get their second coat of white – the hawthorn is coming into blossom. Along the ground around the edges of the housing estate, industrial estates and country park are an array of wild flowers. Cowslips are still in bloom, along with the more delicate Cuckoo Flower (also known as Ladies Smock) and, if you look closely you may notice the small purple blooms of the Ground Ivy. As always, darting above the flowers are the butterflies; Orange Tips, Large Whites and Speckled Woods are all there, waiting for you. So, instead of trying to get away from it all, why not stay home in the midst of it all and relax! Posted on May 1, 2009 Categories Nature, Work-Life BalanceTags Badby, birds, bluebell, butterflies, Everdon, flower, Hobby, NatureLeave a comment on Are you missing out on something this weekend? I couldn’t decide today between a trip to Brandon Marsh and a visit with my spotting scope to the Country Park. I opted for the Country Park on account of a) it being closer so I didn’t have to get the car out and b) it being a weekday so it was less likely to be packed with dog walkers. In the end it proved a good choice. I thought I would start by sitting on the dam and setting my scope up to watch the terns which have moved back in for the Summer. I love watching these birds, they are so graceful and languid as they hunt along looking for fish. I also caught glimpses through my scope of swallows and house martins darting across the water at high speed. The true harbingers of Summer (although I am not sure we have had a spring yet really) also turned up today as I got my first sighting this year of swifts (duly recorded on the Nature’s Calendar website). These birds know no fear, zooming along the dam and up the bank past the cuckoo flowers and startling those who happened to be walking past. Whilst watching these I noticed something fluttering near the trees and turned my scope away from the water to get a wonderful view of a kestrel, hovering above the bank obviously watching its dinner. The colours in the sunlight (which made a briefer appearance than the kestrel) were so rich. However, on today’s visit to the Country Park all of these ornithological wonders were eclipsed. Whilst watching the terns fishing above the water I noticed something else, of a similar size darting across – Hobbies! (Falco Subbuteo) This is the first time I have seen them at the Country Park, I thought there were a pair there, but as I watched them zooming around, turning to show the russet red underbelly, sometimes almost stalling, yellow legs out, obviously catching some flying insect, I realised that there were actually four of them. According to the RSPB website they will also chase martins and swallows, but these seemed oblivious to the predators. I watched enthralled as they darted and chased across the water, even the rain didn’t manage to stop play. Eventually I had to leave them and come home (there was only so long I could sit in rain sodden trousers) but I will be back to see if they stay for the Summer or are just passing through. Posted on May 1, 2008 May 1, 2008 Categories Birding, Nature, PhenologyTags birdwatching, Commn Tern, Daventry, Daventry Country Park, Falco Subbuteo, Hobby, SwiftLeave a comment on Today’s best bird.